Designed for a slip-in fit. Ideal for stove pipe and flexible lining systems. 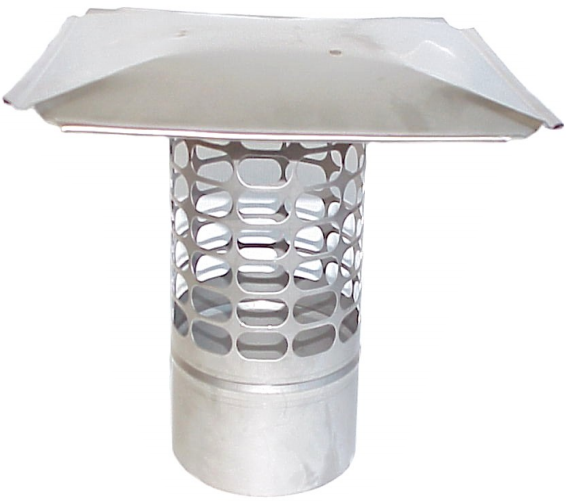 Also can be used on masonry round flue tiles. 24 gauge hood with a one piece base and screening. 8" screen height 3/4” mesh is standard. Superior oval mesh prevents creosote build up. Custom sizes, copper, 5/8” mesh are also available. CCSS3R 3" S/S SLIP-IN ROUND CAP 2-7/8" O.D. CCSS4R 4" S/S SLIP-IN ROUND CAP 3-7/8" O.D. CCSS5R 5" S/S SLIP-IN ROUND CAP 4-7/8" O.D. CCSS6R 6" S/S SLIP-IN ROUND CAP 5-7/8" O.D. CCSS7R 7" S/S SLIP-IN ROUND CAP 6-7/8" O.D. CCSS8R 8" S/S SLIP-IN ROUND CAP 7-7/8" O.D. CCSS9R 9" S/S SLIP-IN ROUND CAP 8-7/8" O.D. CCSS10R 10" S/S SLIP-IN ROUND CAP 9-7/8" O.D. CCSS11R 11" S/S SLIP-IN ROUND CAP 10-7/8" O.D. CCSS12R 12" S/S SLIP-IN ROUND CAP 11-7/8" O.D.